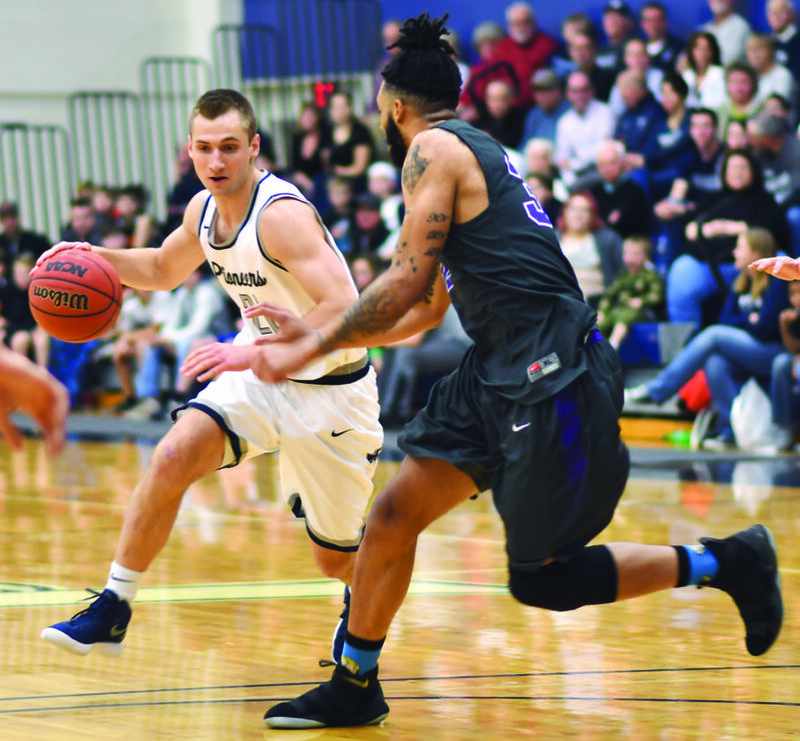 Photo Provided by MC Athletics Marietta College’s Kyle Dixon, left, handles the ball during a college men’s basketball game against Mount Union last season at Ban Johnson Arena. MARIETTA — Lukas Isaly, a 5-foot-11 freshman, is expected to start when the Marietta College men’s basketball team hosts Bethany College (W.Va.) in a season opener at 7 p.m. Friday at Ban Johnson Arena. The former Hannibal River Pilot three-sport standout was a Division IV All-Ohio hoops honoree last winter, averaging 24.4 points per game. Isaly will probably be joined in the starting line-up by Kyle Dixon, Caleb Hoyng, Tim Kreeger, and Mel Shuler. After a year’s absence, Keith Richardson is back and expected to provide the Pioneers with an offensive boost. Two winters ago, the 5-9 Richardson was the Pioneers’ second leading scoring, averaging 15 points per game and a team-high total of 113 assists and 46 steals at his point guard position. Richardson is one of five seniors on the MC roster, and all should be in the rotation and see significant playing time. Of the five, Anthony Wallace (12.9 ppg and 3.3 rpg), and DeVaughn Wingard (10.2 ppg and 3.5 rpg), and Dixon (13.1 ppg and 5.5 rebounds per game) were starters on the 2017-18 team that posted a 21-7 overall record and shared the Ohio Athletic Conference regular season title with John Carroll University with a 14-4 mark. The trio were also All-OAC honorees. Shuler, the fifth senior, was a part-time starter at point last season, averaging 5.5 ppg and 1.3 assists per game. Marietta graduated just two seniors — Dillon Young and Connor McCreary — from last winter’s cage squad which became the first in OAC men’s basketball history to win four straight regular season crowns. A few other players on last season’s roster either transferred or elected not to return. On Halloween of last month, the Pioneers were picked second in the OAC Preseason Poll, and the Blue Streaks first. Some other Marietta cagers to keep an eye on in the rotation could be former Warren High standout Mike Hall, Christian James, and Jason Ellis. Bethany is expected to give the Pioneers some good competition. Last year, the Bisons finished 17-13 overall and were second in the Presidents Athletic Conference with a 14-4 mark. This season’s MC slate Pioneer features 14 games at the BanJo, including the annual Shrine Tournament on November 16-17.